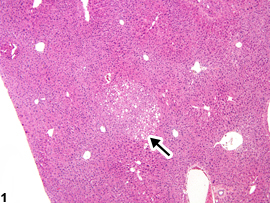 Fatty change-focal fatty change (arrow) in a B6C3F1 male mouse from a chronic study. 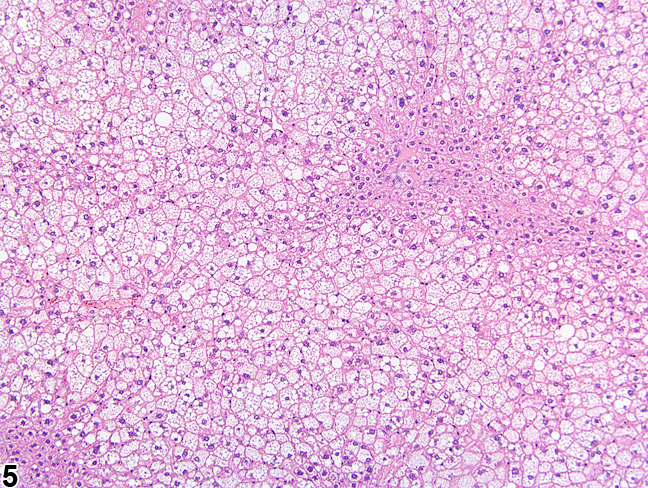 Fatty change-focal fatty change in a B6C3F1 male mouse from a chronic study (higher magnification of Figure 1). 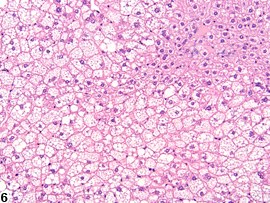 Fatty change-macrovesicular fatty change in a male F344/N rat from a chronic study. 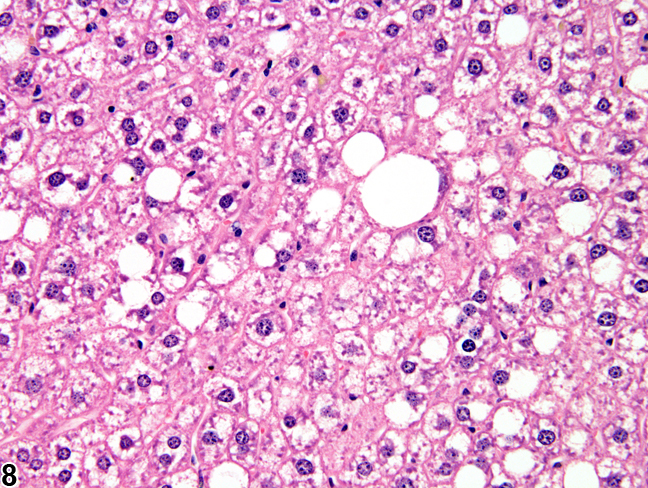 Fatty change-macrovesicular fatty change in a male F344/N rat from a chronic study (higher magnification of Figure 3). 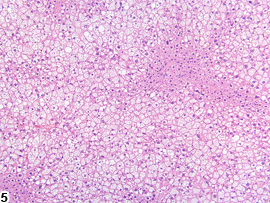 Fatty change-microvesicular fatty change in a male P53+/- (C57Bl/6) mouse from a chronic study. 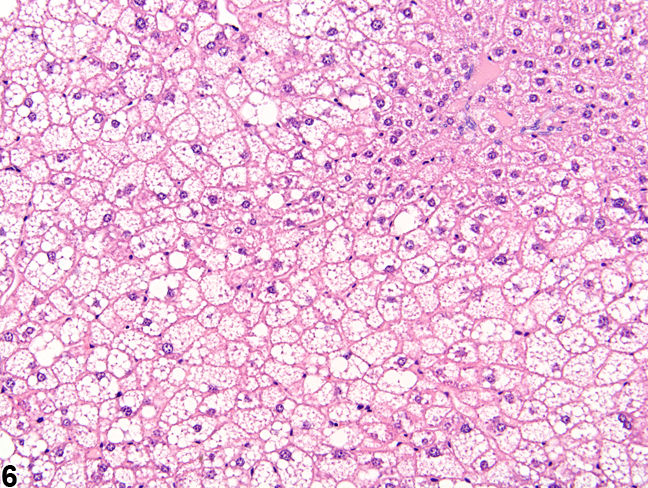 Fatty change-microvesicular fatty change in a male P53+/- (C57Bl/6) mouse from a chronic study (higher magnification of Figure 5). 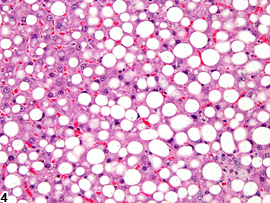 Fatty change-hepatocyte cytoplasmic vacuolation consistent with glycogen and macrovesicular fatty change in a male B6C3F1 mouse from a chronic study. 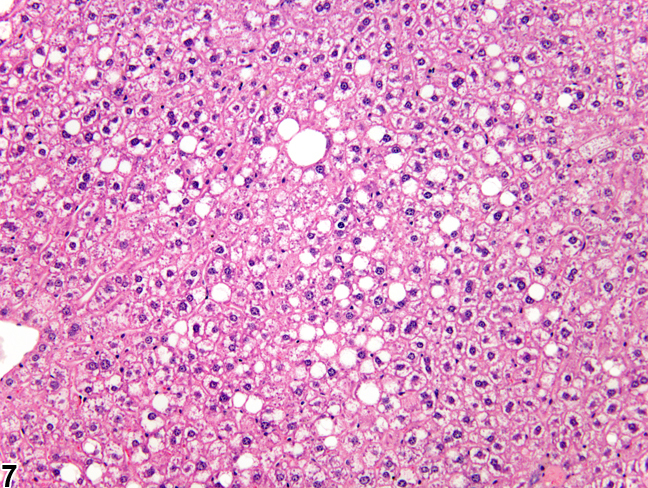 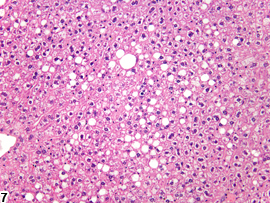 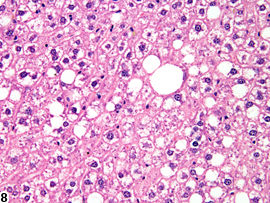 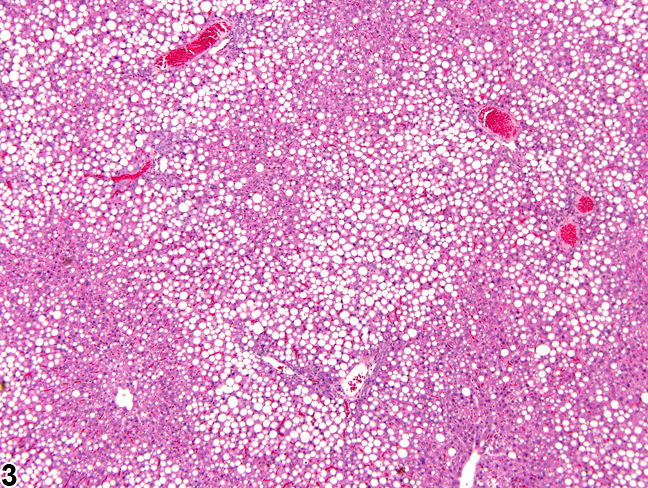 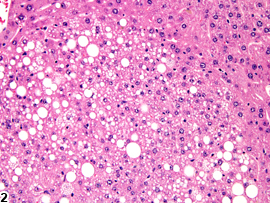 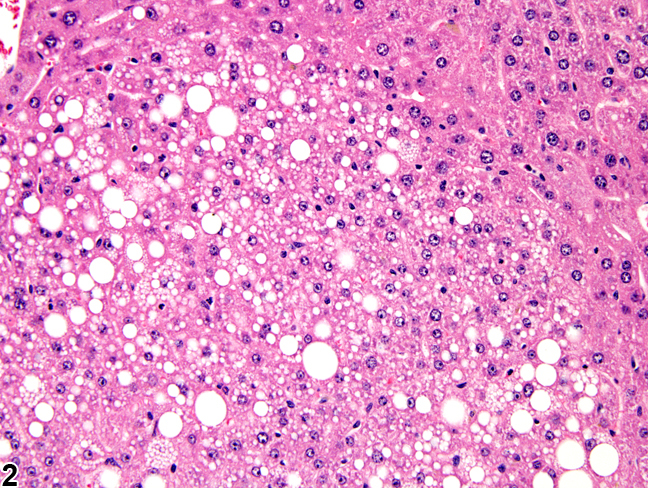 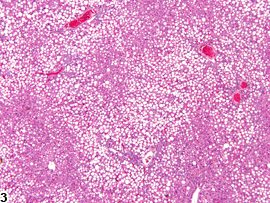 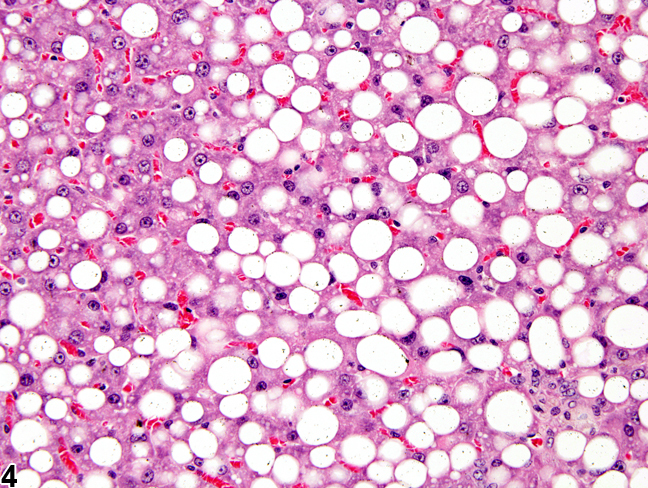 Fatty change-hepatocyte cytoplasmic vacuolation consistent with glycogen and macrovesicular fatty change in a male B6C3F1 mouse from a chronic study (higher magnification of Figure 7).